a weekend long celebration of time, space and the unknown through exploration of experimental art, media and performance. Spaceness is a FREE event and welcoming to people of all ages. An appreciation in your name (or the name of your business) as a contributor will be mentioned in the SPACENESS program. An appreciation in your name (or the name of your business) as a supporter will be mentioned in the SPACENESS program. An appreciation in your name (or the name of your business) as a ‘Sponsor’ will be mentioned in the SPACENESS program. An appreciation in your name (or the name of your business) as top level Sponsor will be mentioned in the SPACENESS program. Sponsored artists will be noted as the donations roll in. Line of Karman is a collaboration between Mixed Needs Plastics Art Collective and Jesse Mejía. For Spaceness 2019, Line of Karman will locate the balance and edge of space with participants through kinetic planetary mobile sculptures. The new works involve two aspects — the creation of an interactive electronic mobile installation in the Pavilion and for the collaborators to host a recycled materials mobile making gathering. To what extent are our interactions mediated by intelligent machines? Who is doing the talking when we let them decide who we interact with and what constitutes appropriate topics of communication? We believe that the time has come to greet each other not with our heads down, staring at our hands and begging for the permission of the minds that oversee our networks, but proudly, standing tall, with our eyes open and aware of our surroundings. 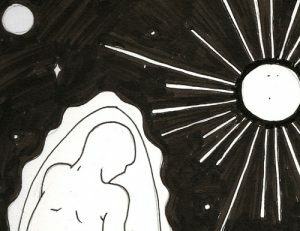 A booklet housing a fragmented cosmic utopian narrative told through image and text, as well as artist project descriptions, schedule, map, donor thanks, and other supporting information. 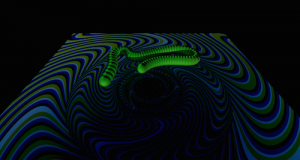 Introduction to Galactic Alienology is a collaborative project by Carson Ellis and her son, Hank Meloy. This body of work was originally created for an exhibit in Detroit called People’s Biennial. It asked artists to select someone to collaborate with who they consider visionary but who is operating outside of the art world sphere. Carson chose Hank, who was 8 years old at the time and is autistic. Together they created a series a paintings of aliens: Hank described them and Carson painted them to his specifications. Carson recorded their conversations as they worked and this audio component accompanies the paintings. we will also film footage at seaview when we are there, to use in our projections. drawing influence from bell hooks ALL ABOUT LOVE, the performance explores the limitations of physical & metaphysical love, space. All of our senses have a voluminous aspect and it is this aspect of our sensations that is our original acquaintance with space argues William James. For this installation a selection of artists, friends and acquaintances will be asked to contribute a scent that they consider to be spacious or vast. 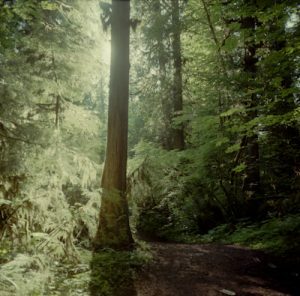 The scents will then be made available in the forest neighboring the Sou’wester until each scent has dissipated. ::GROUNDING:: Aura Reader is an 11 channel TV installation, sensor, and communicative object that provides a diagnosis of visitors’ auric energy. Approach the aura reader, touch the sensor, and visually encounter a reflection of your internal energy (aura) on the TV screens. The noise on the screens is a reflection of the noise inside of you. Let us heal your existential ailments with prescribed rituals that connect your inner spirit across space and time through natural and artificial healing practices. Get grounded throughout the weekend, by approaching the machine; or sign up for specific times to receive your own personalized sound healing. 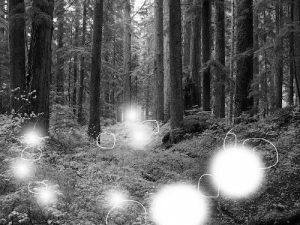 Julia Barbee Suplee / A Fungus Among Us – Fairie circles of puffball extraterrestrial life lives among, nay, within us in the form of mushrooms—surrounding magical happenings—altering our minds, our souls, our dna! Eat what the humans eat; Flying Saucer Breakfast Tostada with beans, shredded lettuce, smothered in New Mexico green chile, and topped with a sunny side up fried egg. 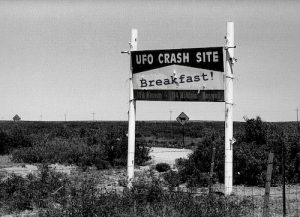 Enjoy breakfast while listening to an experimental sound piece re-telling the alleged 1947 UFO crash in Roswell, New Mexico. For the third installment of Deep Earth-themed performance/public outreach/cosmic transmission, EARTH BABIES (Katie Bernstein and John Gnorski) have paid a visit to the legendary H.H. Hopler archive outside of Penasco, NM. Ms. Hopler (1907-1998) was a writer, sculptor, herbalist, and Earth Baby advocate and contactee whose adult life was spent in the tireless accumulation and cataloging of Earth Baby-related artifacts, texts, and first person accounts. 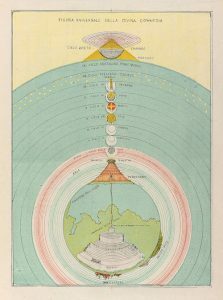 They were granted access to the entire collection including previously unseen notes, watercolors, and photographs from Hopler’s apparent journeys to actual Earth Baby communities deep within our planet. 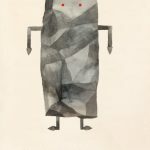 EARTH BABIES: REVELATIONS FROM THE H.H. HOPLER ARCHIVE is a museum-style interactive exhibit complete with field recordings, deep earth artifacts, and ephemera from the Hopler archive. Perhaps most exciting of all, participants will have the opportunity to attempt to make contact with an Earth Baby themselves through a newly-discovered “Deep Earth Post” system. We’re all Earth Babies! Knowledge captured in books can save us. We write stories to translate our realities, sculpting what was once lived into future legends. Spaceness is lucky enough to still be of the moment but will soon live only in the past. The Spaceness Codex (SC) is the last opportunity for this community to define itself for the future of humanity. Part journal, part workbook, part scrapbook, The Spaceness Codex will sit open in the Grand Room at the Sou’wester Lodge. 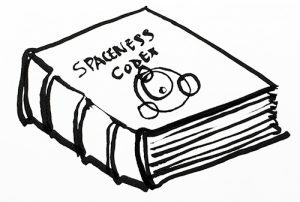 Filled with lore of Spaceness’s past, The Spaceness Codex aims to provide attendees with an opportunity to contribute their own histories of what Spaceness is or has been. Bring your photos, your drawings, your memoirs, your favorite karaoke song, and put it in the one and only historical record of Spaceness on Planet Earth. Old Unconscious sets the soundtrack for a power outage on a ghost ship grasping at any sort of airwave communication in a last-ditch attempt to navigate it’s unexplored trajectory. 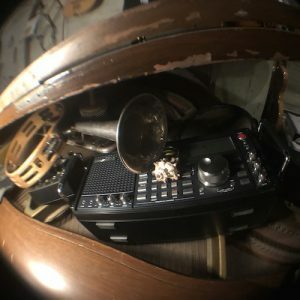 Manipulation of piano, drums, bass and shortwave radios. 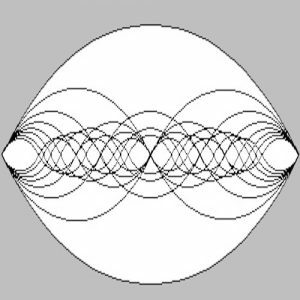 The harmonic series is the foundation of musical harmony and intonation. More than anything else defines what we Earthlings think of as music. It is not a human creation but is present all throughout nature. HUMAN SONG is a piece of music for a chorus of overtone flutes that explores the cosmic language of the harmonic series in attempt to create a Universal expression. 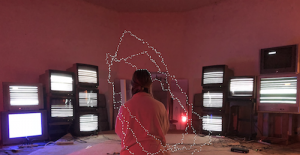 NW immersive media artist DaVideo Tape will draw upon their lifelong research for “Truth” in order to manifest “EncounterZ”, a multi-station semi-outdoor augmented reality/ virtual reality and video art installation. In the process of making this work, Structure Sensor 3D scanning technology by Occipital (https://structure.io/) will be utilized in order to float visitors to the festival, as well as elements from SPACENESS and surrounding area into virtual space. DaVideo’s process of navigating this new terrain for creating mixed-reality experiences utilizing live digital and analog video processing, 3D scanning, and VR realm design using the Unity3D game engine will be documented along the way through a 24 hour live stream online. 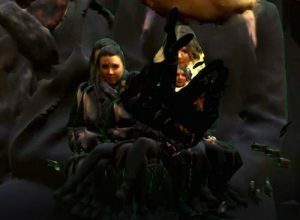 Successes and failures, as well as the attendee festival users themselves, will be documented and invariably become entwined within a reverberating hypermediated array of video feedback loops. 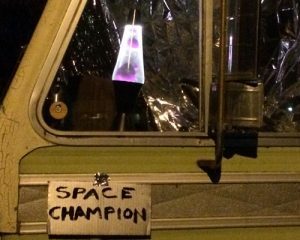 After entering a black hole, the Space Champion was deposited in another time and another place only to be discovered by a group of earthling-obsessed aliens at a space junk yard. Some of them had been to the ‘green’ planet as youngsters, but none of them had ever been back since. They now spend their days reliving those times and trying to replicate humanity from memory. They are truly obsessed, but get it wrong and thats okay! 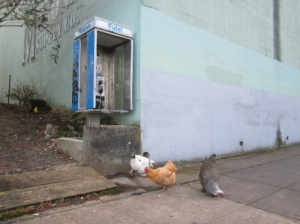 It’s like an Intergalactic game of telephone where everything becomes a little skewed. 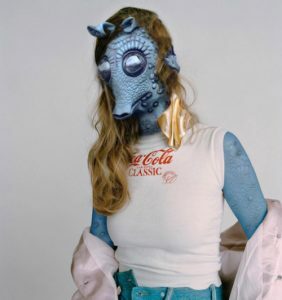 Never before having the means to get to planet earth, these aliens renovated the champion as a nostalgic relic in order to use her as a mode of transportation to make the journey for the biggest party of the year, Earthness. Embracing the theory that the greater universe is mirrored in the lives and minds of each and every human being, this visionary, lo-fi theatrical, multimedia journey aims to create a psychic space within which humans can witness their true outerpaceness, resonating within them at every moment. Images emanate from planetary craters and explode in the faces of governments. Kindness from invisible space-beings is translated in interplanetary, equational poetry. A voice from the event horizon of a black hole teaches peace-talk to children. Cymbals roll like space thunder. Synths freeze on the moon. From the inner reaches of outer space, the opportunity to an altered destiny is delivered; an arch future, a new life on earth for everyone, made in sound. 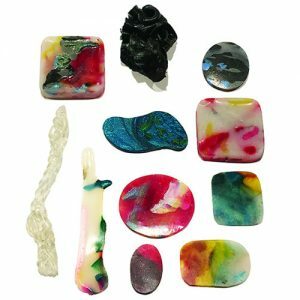 PGF’s Cosmic Closet is a spaced-out lending library of garments and accessories for the Spaceness participant who might be needing that little something extra to outwardly express their interstellar insides. It will feature a changing station, galaxy mirrors, and cosmic photobooth. Items from the Cosmic Closet are welcome to be worn by anyone throughout the weekend, and then safely returned for the voyage home. $20.00 Anything helps! Thank you.